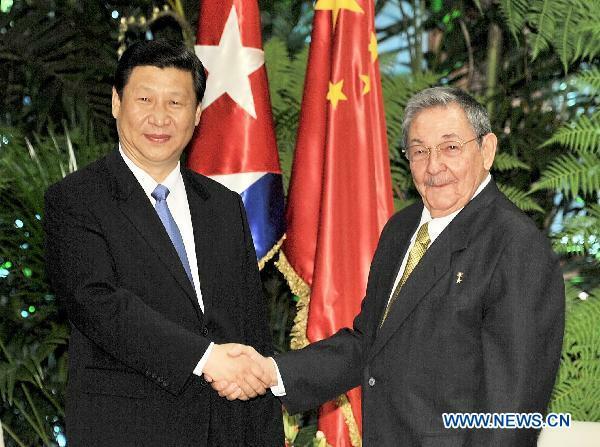 Chinese Vice President Xi Jinping arrived in Cuba on Saturday for a three-day stop during a tour of Latin America. His visit aims to promote bilateral relations and expand business ties between the two nations. Cuba was the first country in the western hemisphere to establish diplomatic relations with China. At a rally held in Havana on September 2, 1960, Fidel Castro said to the audience, "The Revolutionary Government of Cuba would like to ask the Cuban people if you would like Cuba to establish diplomatic relations with the People's Republic of China." Cubans at the rally roared with enthusiasm, raising their hands and chanting, "Yes, yes!" Then, walking towards the nearby chief of the New China News Agency stationed in Havana, Castro said, "Here is the Chinese representative. From now on, I declare that Cuba has cut its relations with the puppet regime of Chiang Kai-shek [in Taiwan]." China and Cuba entered a new stage of bilateral relations starting at the end of the 1980s. When Cuba sank into a severe economic crisis after the breakup of the Soviet Union in the early 1990s, China provided the Caribbean nation with much-needed economic and political support. Arriving in Havana, you might suspect you had gotten on the wrong plane and ended up in China. Chinese bicycles are everywhere in the Cuban capital, and the country has purchased a fleet of Chinese buses to replace its infamous guaguas, which crawl like snails down Havana's streets spewing black smoke and loud noise from outdated engines. Cuba has become China's largest trade partner in the Caribbean, and China is Cuba's second biggest economic partner behind Venezuela. During Xi's visit, the two countries signed 13 deals including a memorandum of understanding for bilateral economic relations over the next five years. This will surely help stimulate the Cuban economy and deepen bilateral economic relations between the two socialist countries. Undoubtedly, bilateral economic relations between China and Cuba are mutually beneficial. China benefits from Cuba's advanced biotechnology and ophthalmology as well as from exporting to Cuba and importing nickel and other primary products. Xi's visit to Cuba could not come at a better time, as the Caribbean nation has just celebrated the convention of its Sixth Party Congress. At the party meeting, Raul Castro promised to carry out many reforms, which are expected to transform economic and political life in the country. The timing of Xi's visit might encourage speculation that he will offer some lessons to Cuba about China's positive experience with its reform and opening policy. For many years, Cuba's economic prospects were quite murky. Now, popular opinion is shifting, with some commentators predicting Cuba will finally become "a China in the Caribbean," implementing market reforms under strict Communist leadership and a socialist regime. Cubans, however, do not accept this opinion, insisting that Cuba will follow its own development path. Nations around the world need to learn from one another, but they should not blindly copy the economic models of successful states. China has established a market economy with Chinese characteristics, but Cuba has not declared that it will build a market system. It has only indicated it will only carry out market-oriented reforms with Cuban characteristics. China's economic development is remarkable. On the social front, however, China is faced with a daunting task. Cuba's economic development, under the U.S. blockade, is quite unsatisfactory, but its social progress has been praised by many people around the world. At a conference in the U.K. some years ago, I heard a Cuban official say: "In Cuba, it's easier to do a heart transplant than to buy an aspirin pill, and it's easier to acquire a university diploma than to get a ballpoint pen." In any case, Cuba is an admirable nation that has persisted in maintaining socialism in the face of an extremely harsh external environment, and China's moral support and economic assistance will definitely contribute to Cuba's next phase of development after the Sixth Party Congress.